The computer is the most essential tools for you. This is used in every place like office, home, government organization, institution. Today, you can not imagine working fast without the help of a computer. You should know about the top important computer component, that will help to understand the technology. As you know that every country chasing to adopt the new technology and they are upgrading the old to new to compete from others. Actually, five important component of the computer is very much important and rest helps the system to perform. The input devices are the arithmetic logic unit, the control unit, the memory unit, the output devices. Besides all the above, a simple computer will normally have mass storage units, where input and output data can be stored on magnetic tapes, disks, CD-ROM, digital audio tapes. 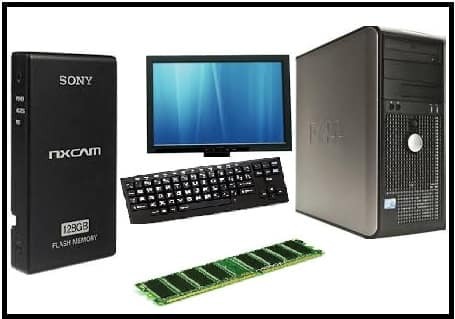 These components should be added with the computer to get the maximum advantage for work. 1) CPU- The central processing unit is the brain of the computer. This is one of the top important computer components. Every process is handled by the CPU. This device works according to the instruction of the Software Programme. Programming is the part, which makes to solve the issue as per your requirement. Most of the components of a computer are incorporated in a single VLSIC or ULSIC chip as stated earlier called Microprocessor and used the system based on the chip are Micro Computer. CPU working with the help of ALU & CU. These are playing the role of communicating with the device like memory, input, and output. You can say this works like the human brain and body parts helps to operate. It is upon you to purchase or assemble CPU as per the requirement of works. 2) ALU- This is a very important place and necessary computer component to execute the instruction, which gives during processing of the operation. This device used for arithmetic calculations and makes logical decisions. Actually, this is helpful for the Mathematical calculation like additions, subtractions, multiplication, divisions. Compare, which should be less than, equal to and greater than. This type of calculation is very tough for you. The computer Arithmetic Logic Unit makes easier with accuracy. 3) The Control Unit- This help to control the operations of the computer system. This makes easier to flow the information within the computer. This works as a connector between the memory unit and ALU and memory unit & devices. Technically this is also very helpful to control the other parts of your computer. Control unit provides assistance to control the timing of communication. This receive instruction interprets them and issues signals to other parts of the computer for the execution of work. This is another important computer component. 4) Memory Or Storage Unit - Every computer has its own memory or storage unit. This is like note-book with space for the fixed number of binary numbers in each line. All data and instruction, which issue for the execution of work through the computer system, have to be stored inside the computer system. So, you can say that memory refers to a storage unit. The storage unit is divided into the number of locations and these locations have the unique identification address for the information stored in it. A word will be stored, which can be data or instructions. Two kinds of memory are there. Which are RAM and ROM?. You can also say that these are the primary storage memory of the computer. 5) RAM- This is called Random Accessed Memory. This is the main memory of your computer. The content of this memory is lost once you switched off the computer. When you restarted the computer, the data is re-loaded to this memory from secondary storage devices like hard disc or floppy. Actually, you can say technologically, this is a volatile memory. This is an important computer component and can not imagine a perfect performance without this. 6) ROM- This is called Read Only Memory. This memory will be used to provide the data only for reading purpose. This is the permanent memory of the computer, so this is also called non-volatile memory. Information, which stores in the memory are for computer started and basic instruction. The right information built into the ROM chip during the manufacturing time. The second thing is PROM, in this, you can write the programme only once. 7) CD-ROM- This is called Compact Disc Read Only Memory. This is an important part of the computer and this is the new kind of ROM. This is a new technology and very popular among computer users. They demand CD-ROM during purchasing the new system. This has a large storage capacity and you can read with the help of the laser. The computer can store a large number of non-changing data through the help of this device. The other features of this device are, you can only one time write on the disc. 8) Peripherals Devices - This device surrounds the central processing unit, so this is called the peripherals device. This will work to share the information link between the outside world and computer CPU and then re-convert them and makes an easier and readable and understandable form. This is also a very important computer component. 9) Input Devices- The input device provides the data, which enter to the computer. The instrument is very important to make the work easier and inform the computer properly to the execution of work. The unit which is used to enter data is called an input device. The basic input devices are - Keyboard, Mouse, Joystick, Light Pen, Magnetic Ink Character Recognition, Scanner. These input devices convert your thought and provide the data to perform according to your wish. These devices play an important role. Every new purchaser should know about these basic useful computer component and aware of the function. They can purchase the computer according to the work requirement. If they want to store a large number of files, they should be hired the good storage capacity CPU. Mouse, scanner, and others should be hired according to the need. The price will be varied according to the additional purchase of supporting tools. Share this post and give your suggestion in the comment box about the post content. That will help to understand the modification part.